Elaine Walter – Master Gardener, Food Gardening Specialist, volunteer at Harvest for the Hungry Garden and “tomato expert” – shares what tomato varieties require less water along with other tips to help you bring tomatoes to harvest in a drought year. Harvest for the Hungry Garden (located in Santa Rosa at 1717 Yulupa Ave, near Hoen) planned ahead and on Saturday, April 26 from 9:00 a.m. to 1:00 p.m., the garden will be selling the least thirsty tomato varieties with an emphasis on tomato varieties developed for California gardens. Yes, we're in a drought, but Sonoma County tomato lovers should not despair. Tomatoes are water camels and not water hogs. Even the thirstiest tomato plant requires only one to two gallons of water per week. But here are some guidelines for shopping for tomato plants this spring. Consider purchasing the drought-resistant varieties recommended by Sonoma County Master Gardeners. These include ‘Stone,’ ‘Caro Rich,’ ‘Pearson,’ ‘Yellow Pear’ and ‘Pineapple.’ ‘Amish Paste’ and ‘Stupice’ also are recommended. ‘Stone,’ ‘Caro Rich’ and ‘Pearson’ will be available at the Harvest for the Hungry plant sale but these varieties will be very hard to find from other sources in Sonoma County. Consider days to maturity. The earlier the tomato, the less water it will require before it yields fruit. Consider determinate tomatoes. These tomatoes will not grow more than three feet high and they typically will yield tomatoes earlier. Once they blossom, you can cut way back or eliminate additional irrigation. The fruit will be extra sweet if you put them on a water diet. Consider cherry tomatoes. There is a reason that the tomatoes growing in the deserts of Israel are cherry tomatoes. 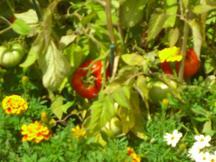 The Israelis know that cherry tomatoes thrive and become even more delicious when they are not over-irrigated. Look for tomatoes bred in California. These include ‘Burbank Slicing,’ ‘Chadwick Cherry’ and the fabulous new ‘Artisan’ tomatoes developed in Sunol by Fred Hempel and the equally amazing tomatoes developed by Brad Gates at Wild Boar Farm in Saint Helena. Even when tomatoes are not California born and bred, Harvest for the Hungry often obtains their seeds from Tomato Fest and Renee’s – two companies that long have been dependable sources of seeds for California gardeners. Recently the Seed Bank in Petaluma and Sustainable Seeds have been added as California sources of seed. Consider tomatoes that have been used for dry farming. These tomatoes are proven to withstand the stress of surface water being reduced or eliminated. While there is not enough rainfall banked in the Sonoma County soil this year to dry farm, you may be able to bring these tomatoes to harvest with less water. Remember that the largest tomato probably is not the best tomato for the drought. Consider taste and quality – not size. Visit the Master Gardener table at the Harvest for the Hungry Garden plant sale. These experts can help you determine how many plants you need and how to conserve water while growing them. Finally – rejoice that growing a tomato in Sonoma County takes less water than growing and transporting a tomato from elsewhere. Homegrown tomatoes are not a luxury; they are a duty. Harvest for the Hungry Plant Sale Manager, Carla Wedemeyer, is very excited about this tomato year. “The biggest problem with tomatoes and home gardeners is overwatering,” she said. ”And this year that should not be a problem.” Harvest for the Hungry lists its over 100 varieties of tomatoes on its website www.harvestgarden.org.